Walden Schmidt and Alan Harper (Ashton Kutcher and Jon Cryer) have spent another year searching for the ideal life in their Malibu beach house. 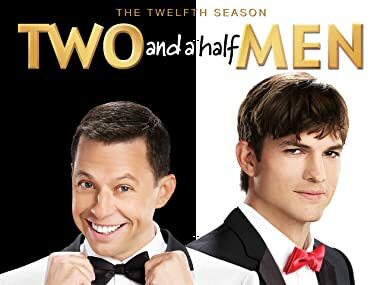 In the 12th and final season, Alan and Walden will continue their search for true love, contentment and the meaning of life. And they may actually find a couple of those things! On the twelfth season premiere, Walden decides to reprioritize his life with Alan’s help, following a Halloween health scare. AISHA TYLER guest stars as Walden’s lawyer. When Walden asks Alan to sign a pre-nuptial agreement, Alan gets offended and has second thoughts about getting married. MICHAEL BOLTON returns as himself. Walden and Alan have a meeting with an adoption social worker that hinges on them being convincing as a loving couple. Meanwhile, Lyndsey returns after 60 days in rehab. Walden and Alan meet a birth mother who’s considering them to adopt her baby. MAGGIE LAWSON guest stars as a social worker helping Walden and Alan adopt a child. Walden decides to foster a six-year-old boy, but begins to doubt himself when they don’t bond like he expected. EDAN ALEXANDER joins the cast as Louis, the foster child. When Alan realizes that Louis thinks he’s cool, he starts breaking Walden’s rules in order to stay that way. Series star Jon Cryer directs. Alan and Walden befriend three moms at a kids’ gym, but things get complicated when Walden becomes attracted to one of them. Meanwhile, Alan joins the moms for a girls night out. Walden and Alan are determined to convince Louis that Santa Claus is real. MELANIE LYNSKEY returns as Walden’s stalker, Rose. Walden discovers how challenging it is to be with women with Louis in the house. Also, Herb (RYAN STILES) asks Alan if he can go on a date with Lyndsey (COURTNEY THORNE-SMITH). 10. Here I Come, Pants! Alan takes it upon himself to help Walden keep Louis after the social worker, Ms. McMartin, discovers that he and Walden are not really a gay couple. 11. For Whom the Booty Calls! Walden joins a group for adoptive fathers, and finds it to be a nice escape from Alan. When Alan breaks up with their social worker to get back together with Lyndsey, Walden worries it might affect Louis’s adoption. Walden fears that if he breaks up with Ms. McMartin, it will jeopardize his adoption of Louis. Also, Alan hesitates when Lyndsey asks him to move in with her. After they sign their divorce papers, Walden offers Alan the gift of his choice, but Alan’s selfish & impractical choice puts his relationship with Lyndsey on the line. Charlie Harper is alive. Or is he? Find out in the special one-hour series finale. Surprise guest stars appear in the conclusion of the successful comedy’s twelfth and final season.